Scarring can have a profound impact on someone’s self-confidence, no matter if the mark was created by a burn, genetic condition or acne. Psychological, emotional and social effects of scars are notable among people who suffer from visible scars. In other words, people who carry visible scars on the hands, arms, neck, and face suffer from embarrassment and low self-esteem. 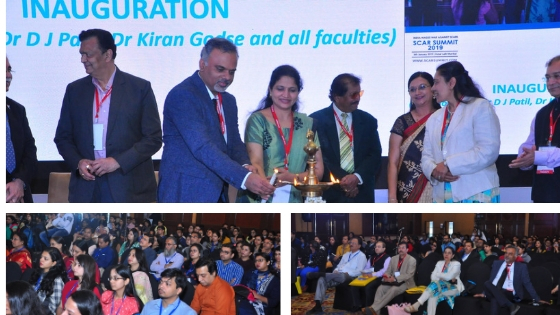 To fight the battle against Scars, Skin City’s Post-Graduate Institute of Dermatology in association with the Society for Lasers in Medicine and Surgery (SLIMS) organized the first ever Scar Summit 2019. Distinguished medical professionals from the Medical fraternity descended on Mumbai to attend the much-coveted conference. Over 320 delegates, comprising of well-known Dermatologists, Plastic Surgeons, Maxillofacial Surgeons, General Surgeons and Clinicians from across India gathered at the Lalit, Mumbai, to confer and concur on the best approach in the management of scars, their prevention, and treatment. Why Was the Conference Important? The conference was inaugurated by Senior Plastic Surgeon Dr. Sunil Keswani, Dr. Ashok Naik and Dr. D J Patil, the latter duo being former Professors of Dermatology at B J Medical College. Dr. Sunil Keswani took an excellent review of prompt and correct management of burns which can prevent or minimize hypertrophic scars. Dr. Niteen Dhepe, Medical Director Skin City, has been a pioneer and key opinion leader in the treatment of scars. He has been the ambassador of laser technology for several Pharmaceutical companies who have supported this Summit. Various experts like plastic surgeon, Dr. Lakhsyajit Dhami and dermatologists Dr. Girish Shah and Dr. Venkatram Mysore discussed the role of such laser and energy based devices and their role in scar treatment. However the highlight of the conference and the most riveting topic by far was the session on keloids, addressed by Dr. Niteen Dhepe. Keloids are scars that display uncontrolled growth patterns with no effective solution at the present moment. The First Victory in the Scar War! Dr. Dhepe the host and innovator in scar treatment presented his new therapeutic classification of scar and scar-like conditions. He also presented his innovative 5 tier treatment technique using Ultrapulse CO2 fractional laser for the treatment of acne scars and his innovative technique of keloid treatment with fractional drug delivery using SCAAR FX technology and Enerjet JVR needleless injector. He also introduced two future technologies for the prevention of scars, which are fractional skin grafting and laser scar prevention. Dr. Somesh Gupta of All India Institute of Medical Sciences, Delhi took an insightful review on the pathophysiology of keloid formations and current and future options in keloid management. The reviews from the participating delegates was very encouraging, Dr. Dhananjayay Chavan one of the attending delegates said that it was a very engaging an informative conference. In view of the overwhelming response, SkinCity declared that the war against scars is an ongoing one, not yet won and therefore has decided to conduct this academic event every year.